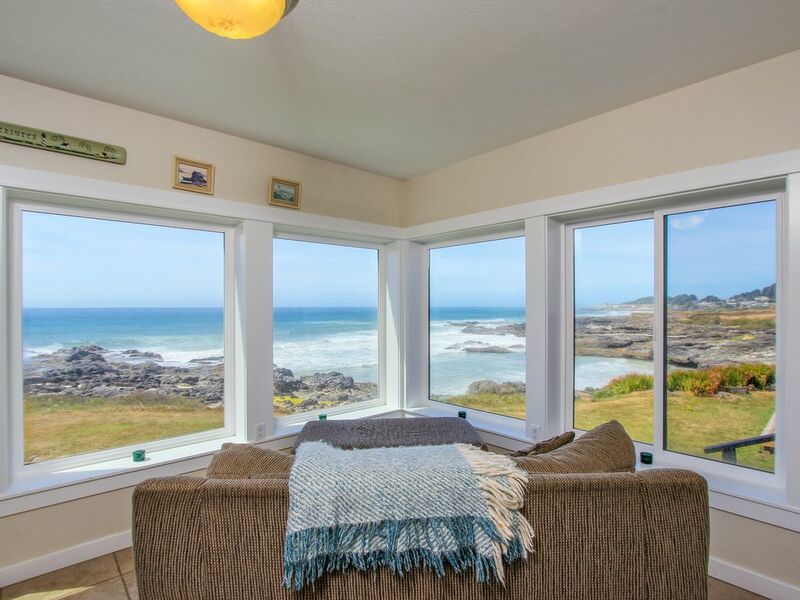 This dog-friendly, oceanfront home in Yachats offers guests a prime location with a private hot tub, two decks, and sweeping ocean views. This is a single home made up of two separate, complete units. The upper and lower level may be rented separately for smaller groups of eight, with the lower level being ideal for guests with mobility issues. Parking Notes: Please only use designated parking spaces, and be aware that the car limit is strictly enforced. There is available parking for six cars. Please do not park on the grass, and note that campers, tents and R.V. 's are not permitted on the property. Thank you for your cooperation. Water Access: It is a 5 minute walk to a sandy beach and tide pooling in front of the house. We would like to thank you our guest for taking the time to leave a review for us. The sink leak has been fixed, the shower curtain replaced, and the tape on the hot tub addressed. Firewood is not an amenity for this home though there is firewood to be purchased nearby. Thank you! Located within walking distance of the charming village of Yachats, this home was the perfect place for our three-generation extended family reunion. During our week-long stay, we enjoyed the continually changing views of tidal fluctuations, sea lions, whales and seabirds from the decks and windows of both levels of the home. After acquiring proper permits, we were able to harvest enough fresh mussels from the rocks just below the property to prepare a wonderful gourmet dinner. The layout of the house, with two separate, connected levels, each with kitchens, bedrooms, bathrooms and laundry facilities, was ideally suited for our group of 13, with five children between ages 4 and 10. We could enjoy many simultaneous activities, from watching movies, playing games, reading books, to napping. Both of the kitchens were very well-equipped and we were able to prepare most of our meals on-site. The location of this property, in close proximity to such landmarks as Cape Perpetua, Neptune Beach, Devil's Churn, Thor's Well, and the Yachats River and Bay provided ample opportunities for short hikes and beach activities. Within an hour's drive we were able to experience sand dune tours, seal caves and the delightful town of Florence to the south and the Oregon Coast Aquarium, clamming beaches and the crabbing wharf near Newport to the north. This house had ample supplies of fresh linens and towels, pots and pans, cooking and serving utensils. The furniture was comfortable, in good condition and the beds were comfortable and clean. This family getaway was one to remember and our house on the beach helped enhance our experience.